Over time, even with the most careful operation of furniture on its surface can be formed a variety of spots. This problem will help you cope as chemicals and electrical appliances. It is understood that the upholstery is different, and each requires its own approach. Currently, there are three ways to clean upholstered furniture – dusting with powder, using foam and wet method. Everything will depend on the degree of contamination and what caused the dirt. There are drugs that are so strong that after cleaning can change the color of the fabric. Even the assurances of friends about safe money can not serve for you, because the furniture could be made completely of a different material than yours. You can avoid problems if you try out a new cleaning product on a small and inconspicuous area to make sure that everything will be fine. Foam for cleaning of soft furniture, manufactured in cans, is considered one of the most reliable tools as it is easier to use just. For this you need to gently shake the bottle, press the button and apply the foam on the furniture. In sale there are also funds in liquid form that need to cook for themselves. To foam by mixing the drug with warm water and whisking it to the formation of the desired consistency. Next, using a sponge to apply the product on the spot, trying not very hard to moisten the surface. Then the cleaning agent is rubbed into the dirty area in a circular motion. If heavily soiled, you can splash the product on the cloth directly from the cap. Spray stain remover is sold in a special bottle with a convenient spray. It is necessary to apply it on dirty place and wipe the upholstery with a sponge or clean cloth. If you have the first you don't succeed to remove the dirt, repeat this procedure. If the dirt is ingrained not particularly strong, you can try a special powder, which includes special microcube. It is applied on a dirty surface and allow to soak. When the medium is dark, and the remains removed using a conventional cleaner. If you use powder you should be careful with velvet, cotton cloth, velvet and other "soft" materials. Natural leather or substitutes to wash with water is not advisable since it can tarnish. For this you will need a solution of vodka and vinegar (1:1). 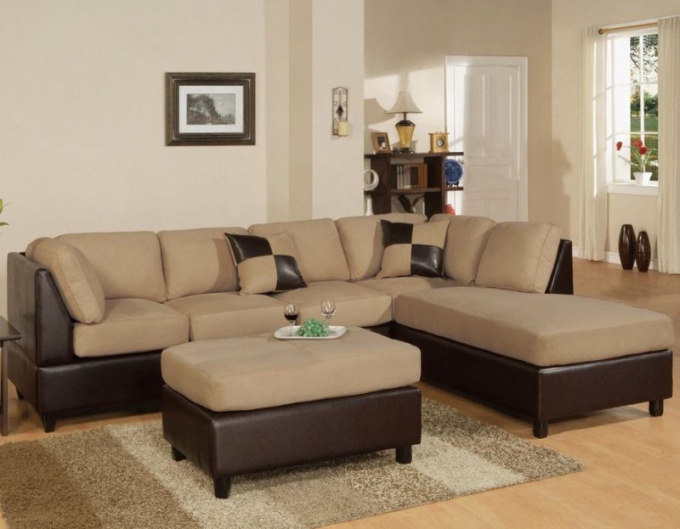 It would be better to have special covers for the sofa, which then can be easily washed by conventional means. This will help you to get rid of in the future from many problems.